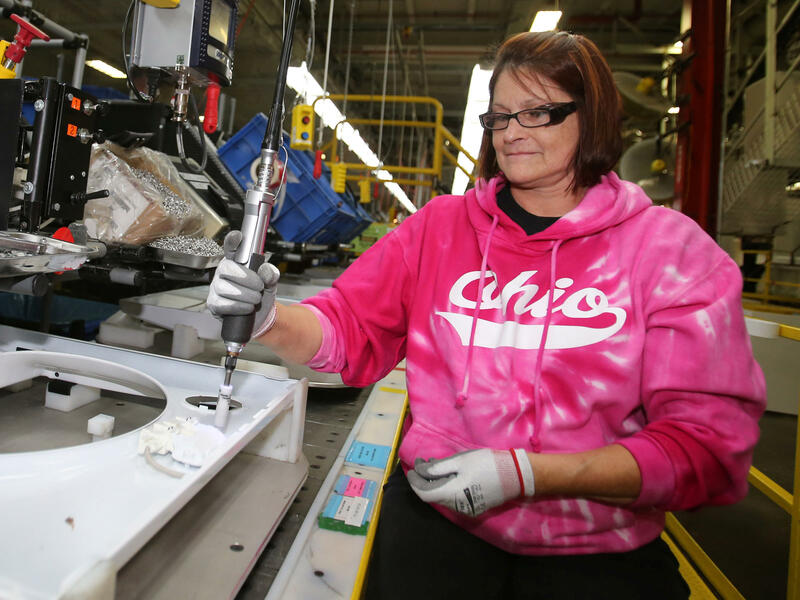 Deb Eisenhawer assembles a switch for a washing machine at a Whirlpool plant in Clyde, Ohio. The company's CEO says steel costs have reached "unexplainable levels." Nucor, the largest US steel company, said in July that its second-quarter earnings more than doubled, partly because of higher steel prices. U.S. Steel has embarked on several large capital projects and has recently reopened two blast furnaces at a facility in Granite City, Illinois, a plant that Trump visited on July 26. "The commitment he has to steel is unprecedented," U.S. Steel CEO David Burritt said during an Aug. 2 conference call with Wall Street analysts. "You have to be able to make steel if you want to have a strong country," he added. "We don't expect the president to blink." Still, the number of manufacturers that produce steel is dwarfed by the number that consume it, and many companies have complained they're facing higher prices because of the Trump administration's tariffs on steel and aluminum. They include major names such as General Motors, 3M, Stanley Black and Decker, and Caterpillar. The higher prices aren't a huge problem at a time when the economy is faring well, says Scott Paul, president of the Alliance for American Manufacturing, which supports the tariffs. "I've seen expressions of concern about the tariffs, but the data still indicates that the economy is strong, that manufacturing is strong," Paul says. Still, the tariffs add a big note of uncertainty to the companies' bottom lines. "Global steel costs have risen substantially and, particularly in the U.S., they have reached unexplainable levels," Whirlpool CEO Marc Bitzer said during a recent analyst call. "Uncertainty related to tariffs and global trade actions" is pushing up costs, he added. Ironically, among the companies warning about uncertainty are producers of aluminum, even though the Trump administration has also slapped 10 percent tariffs on imports of the metal. That's because aluminum giants such as Alcoa tend to have a more global focus than steel, churning out more products overseas that are subject to the tariffs when they're brought back to U.S. shores. Hundreds of companies have asked to be exempted from the steel and aluminum tariffs, but their requests have often been rejected, according to a recent New York Times report. "The tariffs are working exactly the way we would expect them to. They're going to produce winners and losers," says Mary Lovely, a professor of economics at Syracuse University. Tariffs make imported steel more expensive, which means domestic producers don't have to worry as much about price competition and can increase what they charge customers. That could lead them to hire more workers and invest in new production, Lovely adds. The outlook is different for companies that must buy steel, she says. "The companies that use steel, like aluminum can manufacturers, or companies that make steel vats for pharmaceuticals or the dairy industry, they're going to be hurt by this," Lovely says. Higher costs will force some of them to raise prices, hurting their sales, she notes. Mid Continent Nail Corp. in Poplar Bluff, Missouri, has closed a multimillion-dollar plant and is "on the brink of extinction," because of the tariffs, a spokesman has said. At Staber Industries, an Ohio company that makes washing machines and other appliances, business has been especially good since Trump's election, with plenty of new orders from customers, says the company's president, William Staber. But steel and aluminum prices are rising so fast that planning becomes very difficult, he says. "You go get a quote today, it's good through the end of business today, period," he says. Staber points out that much of what his company buys are specialty metals that aren't made in the United States, giving him no choice but to import them. "It's all about protecting jobs and saving jobs. OK, I get that," he says. "But we're not even making it here. So whose job are you saving when you're not doing it here?" Paul says he has heard from manufacturers complaining about the rising costs of aluminum and steel. "I think what's on their minds is, how long are the tariffs going to last? They're looking for some certainty as they move ahead and are making investment and hiring decisions," Paul says. It's time for quarterly earnings reports at many companies. And that gives us a chance to compare President Trump's rhetoric on trade with the reality that American manufacturers are facing. NPR's Jim Zarroli reports. JIM ZARROLI, BYLINE: At a rally in Pennsylvania earlier this month, President Trump boasted about the comeback of one American industry. PRESIDENT DONALD TRUMP: We're putting our steel workers back to work at clips that nobody would believe. TRUMP: U.S. Steel is opening up seven plants. ZARROLI: In fact, U.S. Steel isn't opening up seven plants. But it has restarted a couple of blast furnaces in Illinois, and it has announced some other capital projects. CEO David Burritt appeared on Fox Business Network recently. DAVID BURRITT: So we're absolutely excited for our team and for our customers so that we can provide mined, melted and made-in-the-USA steel. ZARROLI: Steel companies are among the biggest beneficiaries of President Trump's decision to impose tariffs on imported metals. The tariffs make imports more expensive, and that's helped drive up steel prices. Mary Lovely is a professor of economics at Syracuse University. MARY LOVELY: The tariffs are working exactly the way they should. They produce winners and losers. ZARROLI: Among the losers, she says, are companies that have to buy a lot of metals to be used in manufacturing. Suddenly they have to pay more. LOVELY: The companies that use steel like aluminum can manufacturers, they're going to be hurt by this. ZARROLI: Over the past few weeks, companies such as Caterpillar, Whirlpool and General Motors have said they're having to contend with rising metal prices. The higher costs come at a time when manufacturers are otherwise faring well. William Staber is president of Staber Industries, a small Ohio company that makes washing machines and other products. WILLIAM STABER: We are so busy that it's out-of-control busy. The orders just keep coming in here, and it's never-ending. ZARROLI: Still, Staber says the rising price of aluminum and steel is causing him headaches. STABER: You go get a quote today, it's good through the end of business today period. ZARROLI: Staber says much of what his company needs to buy are specialty metals that aren't even made in the United States. He has no choice but to import them, so tariffs make no sense. STABER: It's all about protecting jobs and saving jobs. OK, I get that. But we're not even making it here. So whose job are you saving when you - we're not doing it here? ZARROLI: That's a view that Scott Paul is familiar with. The trade group that Paul heads, the Alliance for American Manufacturing, supports the steel and aluminum tariffs. But Paul concedes that many of the manufacturers he represents don't. He tells them the prices should eventually come back down. Paul says the cost of the tariffs is a small part of the $19 trillion U.S. economy. SCOTT PAUL: Obviously some steel consumers will face some price adjustments. But overall, a lot of the signs point to a healthy economy. ZARROLI: Paul says the U.S. has longstanding problems with China and other trading partners, and the tariffs are part of a strategy to address them. There may be some pain now, he says, but in the end the benefits will be worth it. Jim Zarroli, NPR News. Transcript provided by NPR, Copyright NPR.